The supporters of the Venezuelan President took to the streets of Caracas to protest against Donald Trump’s statement about possible military action. MOSCOW (Sputnik) – The supporters of the Venezuelan President Nicolas Maduro took to the streets of Caracas Monday to protest against US President Donald Trump’s statement about possible military action in the Latin American state, local media reported. On Friday, Trump said Washington was considering the possibility of a "military option" in Venezuela in case it was necessary. The Telesur broadcaster specified that the demonstration, which started early in the morning, was dubbed "Anti-imperialist March." Earlier in the day, Venezuela's ruling Socialist United Party (PSUV) made a post on its Twitter blog announcing the mobilization of the Venezuelan people to defend sovereignty and independence. 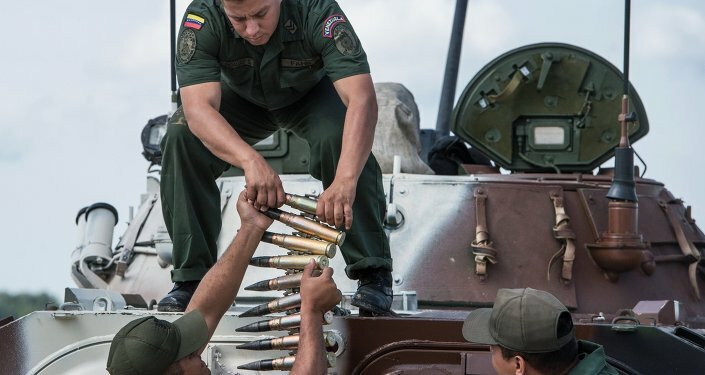 Venezuelan Defense Minister Vladimir Padrino Lopez said also on the same day that the country's armed forces are ready to take all necessary steps to protect the country after Trump's Friday statement. Venezuela plunged into turbulence in March, when the Venezuelan Supreme Court decided to restrict the power of the legislature. The decision was immediately reversed amid a backlash, but supporters of the parliament, who strive for the dismissal of the court members, took to the streets on April 4, marking the start of deadly protests which have so far claimed lives of over 120 people. The protests were fuelled by the June 30 Constituent Assembly election, initiated by Maduro with the intention of rewriting the constitution of the unsettled nation. Venezuela's opposition, as well as the European Union and the United States, among other countries, have refused to recognize the body's legitimacy. Venezuela: Military Coup Attempt or Terrorist Attack?